In addition to conducting fMRI-based canine neuroscience research, CPT, Dog Star Technologies, and the Emory University Dog Project Team conduct canine psychology research that is behaviorally-based. In September 2014, the mentioned participants conducted behavioral research in conjunction with the University of Arizona and University of Florida psychology departments. 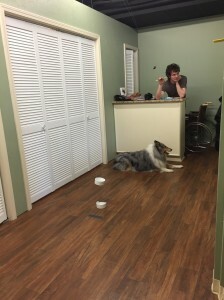 The September 2014 experiments that studied behavior within a radial arm maze provided information about the working and spatial memory ability of canines. More recent experiments conducted on March 15 and 29, 2015 studied inhibitory control. The inhibitory control experiment described in this article is the team’s creative adaptation of the famous Stanford Marshmallow Test. The Marshmallow Test was originally conducted by Stanford University psychologist Walter Mischel. 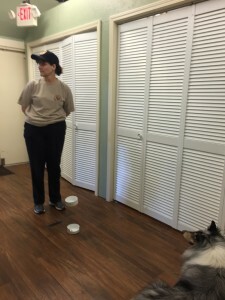 Canine Marshmallow Test participant Janice Geller positioned 6 feet from Holly the Collie during an early stage of the Test. In the 1970s, Mischel and his research team presented approximately 600 children between the ages of 4 to 6 a delayed gratification dilemma. The experiment started with the researcher and child alone in a room that consisted only of a table, a chair, and a plate positioned atop the table. While the child sat in the chair, the researcher placed a marshmallow on the plate. The researcher next instructed the child, “I am now going to leave the room and will return a little later.” The researcher continued, “If you don’t eat the marshmallow on the plate, I will return with a second marshmallow and you can then eat both marshmallows.” The researcher subsequently departed for approximately 15 minutes while a hidden camera recorded the child’s actions. Some children ate the marshmallow immediately. Other children waited, but did not last the entire 15 minute time period before the researcher returned. The children with the most inhibitory control waited either patiently or impatiently (the facial expressions, gyrations, and pacing of some of the kids is highly amusing) for the entire 15 minutes, whereby upon his/her return the researcher allowed the child to eat the marshmallow on the plate plus a second marshmallow. 10 to 18 years later Mischel brought the kids back for follow-up studies. The findings from the follow-up study were remarkable. The children who exercised inhibitory control by exercising delayed gratification on average were more successful in young adult life, as determined by higher SAT scores, higher educational attainment, and lower BMI (body mass index). A later follow-up study in 2011 conducted neuroimaging when the participants were in their mid-forties. In the 2011 follow-up, during a Go/No-Go task, those who delayed gratification in their youth had more activation in the prefrontal cortex (a brain area responsible for inhibitory control) and less activity in the ventral striatum (a brain area responsible for the cognitive processing of pleasure, motivation, and reward and an area that is often overly stimulated in those with addictive disorders). Thus, the performance of the youthful participants was highly indicative of success and rational decision making skills when they reached young adulthood and middle-age. Janice, with her back turned, positioned 12-feet from Holly during a later stage of the Test. The study conducted at CPT was co-designed by Mark Spivak, CPT’s Head Trainer, and Peter Cook, PhD and Ellie Studdard of the Emory University Neuroscience Lab. Since dogs could not communicatively process the specific delayed gratification protocol of the Stanford Marshmallow Experiment, the team made several insightful adaptations. As a qualification criteria, to participate all the dogs needed to have received prior training on the down-stay. 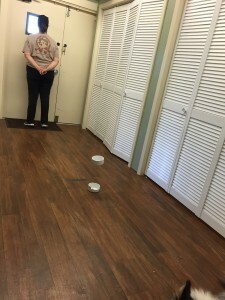 Once the team selected participants, the experiment consisted of the owner first placing the dog in a down-stay, then placing a treat in a dish positioned 3 feet from the dog. The owner next moved 6 feet from the dog while facing the dog. In subsequent trials the team placed the owner 6 feet from the dog with his/her back turned and 12 feet from the dog with the owner’s back turned. Finally, the team placed the owner out of sight. The initial time duration was 10 seconds. The later time duration was 2 minutes. When the duration elapsed, the experimenter would silently cue the owner to return to the side of the dog, whereby the owner would verbally release the dog to eat the treat from the dish. 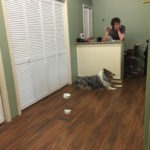 However, if the dog moved prematurely, the team had an apparatus configured that lifted the dish to the ceiling, which prevented the dog from receiving an inappropriate reward. Peter operated the mechanical pulley and sling. Ellie instructed the human participants, gave them their silent cues, and recorded the data. Mark observed the operation to recommend amendments. Peter will later compare the data to the results of another behavioral test, the A not B Test, and to a neuroimaging Go/No-Go Study designed by Peter, Emory Prof. Gregory Berns, and Mark. Peter managing the treat dishes and pulley apparatus during the 2-minute owner out of sight repetition. The Dog Project’s Canine Marshmallow Test acquired some interesting data. Next, the team will compare the behavioral data with the fMRI data to determine whether inhibitory control is generalized versus context dependent and whether inhibitory control in the experiments is correlated to the dog’s C-BARQ behavioral profile and an overall lack of pet-related behavioral problems. Once all the data is accumulated and analyzed the team will author an academic paper for publication in a peer reviewed journal. For those interested in volunteering their pets for The Dog Project, please contact Mark Spivak by email (MarkCPT@aol.com) or contact the CPT office by phone (404-236-2150).